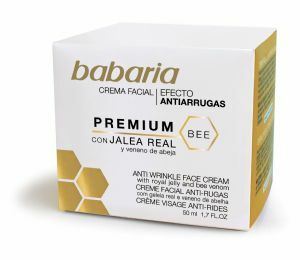 Babaria Bee Sting Venom Anti Ageing Cream 50ml | Mia Beauty Ltd.
A product developed by combining bee venom and royal jelly to obtain a highly nourishing cream, to which Vitamin B£ is added to prevent wrinkles and facial lines. It also contains sunscreen. The Duchess of Cambridge and Duchess of Cornwall are already fans of bee venom. Honey bee venom (toxin melittin) 'fools' the skin, causing a rush of blood to the area and stimulating production of natural collagen and elastin. 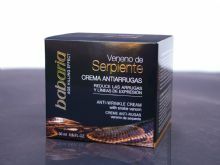 Your pocket won’t feel the sting as our cream is sensibly priced unlike some of our competitors. The bees are not harmed in the process, they are invited to deposit their venom in a membrane which is then collected from the hive and the venom is extracted from it. Aqua (Water), Pentylene Glycol, Niacinamide, Oleyl Erucate, Propylene Glycol, Octocrylene, Octyldodecanol, Gycerin, Sodium Polyacrylate, Bee Venom, Royal Jelly, Tocopheryl Acetate, Dimethicone, Parfum(Fragrance), Tetrasodium EDTA, Acrylates/Vinyl Isodecanoate Crosspolymer, Lactic Acid, Sodium Benzoate, Potassium Sorbate, Alpha-Isomethyl Ionone, Butylphenyl Methylpropional, Eugenol.